Tired of looking all over the place to find those essential documents when you need them? Storing irreplaceable family memorabilia & paper work in a flimsy old filing cabinet? Rethinking your bush fire protection plan after the Pinery & the Sampson Flat fires? It might be time to look into getting a Fire Safe. Sure there are a lot of “safes” available at discounted hardware stores but unfortunately you’re getting discounted value. Most of these cheaper safes use a play on words by telling you that they’re “Fire Resistant” which generally involves a thin sheet of roofing insulation stuffed between the outer and inner casing. 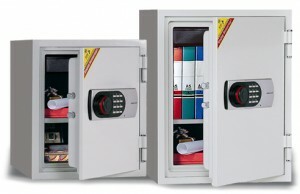 If it’s quality you’re after, be sure to check out our range of Fire Proof Safes. These safes are rated for up to 1hr at 1010°C by using a concrete fire retardant & can withstand a two story drop even after being burnt ( to simulate falling through a burnt floor ). Offering an electronic combination that can store two individual codes for separate users. The codes can be changed as often as you feel necessary. Using 4x AA batteries as a power source you’ll have ample battery life, even then the batteries are fitted externally which means no need to store an override key & it will still retain your existing code(s). Not only does the safe offer protection from just fires, it also has a few safety features which include the following; two internal mounting points, internal hinge bolts to prevent entry ( even if the external hinges are tampered with ) & a security override code in the event of an emergency. With various sizes available we can accommodate to all people, be it either Residential or Commercial.